Avondale’s ethos Terra Est Vita or Soil is Life is not a corporate strapline. It is the philosophy by which we farm; a living system where everything from the earth itself to the animals, people and buildings are integrated in our circle of life. We have a small herd of Aberdeen Angus – 4 heifers, 4 “tollies” ranging between 5 and 10 months, and 6 cows including the matriarch between the ages of 2 and 19. The original stock originates from my neighbour and so they are all basically born at Avondale and very much adapted to the climate. Cows contribute to nature’s chain in several ways; bringing diversity, energy, enzymatic processes and most obviously, manure. We utilise a concentrated grazing system with portable electric fencing; this way we can manage our pastures, get the best quality food for the cattle and make sure we do not get selective- or over-grazing taking place. 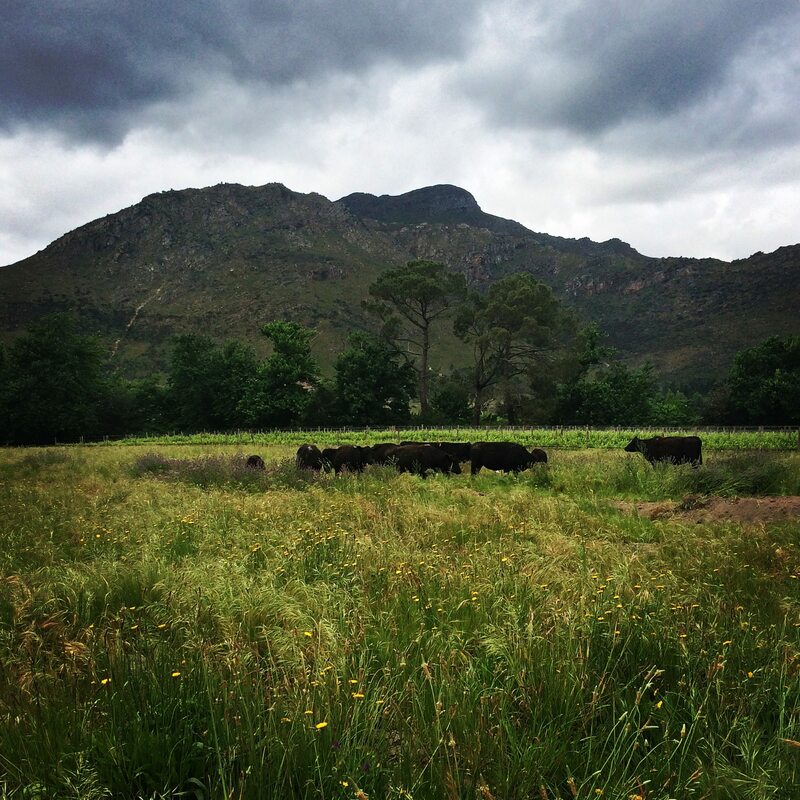 Our cows graze in our nutrient-rich pastures ensuring they eat when they want and whatever is available, as nature intended. I believe that this leads to happier cows that produce better meat. Certainly it is better than feed-lot cows that are fed a high protein diet, usually involving grain from GM crops, which is not good for their alkaline digestive system. Cows are designed to graze on pastures and are not used to eating high carbohydrate diets that cause their digestive tract to become acidic which in turn creates serious health issues. As a result feed-lot cows have a shorter lifespan and also spend their whole lives on antibiotics; certainly not comparable with the pasture-reared cows at Avondale. In the coming months we will be breeding with our Angus cattle and I hope that in the not too distant future we will be able to use Avondale beef and supply local consumers. I identify very much with Joel Salatin’s ‘Salad Bar Beef’ concept – so called because of the ‘salad bar’ or diverse pasture on which the cows graze. As the cows walk through the fields their cow pats are left behind them, and in conventional farming this can lead to patches of fast growing grass caused by a build-up of concentrated nitrates. Mimicking nature we allow other animals such as chickens to walk through after the cows, which has several benefits; they eat fly larvae, which reduces flies; the chickens defecate giving additional fertiliser; and their talons spread the dung giving more even coverage. The cows move regularly to new pastures to avoid over grazing, and do not return to the same field until the nutrients have broken down, replenished the soil and the pasture has recovered. By the time they get back to the pasture it will be lush, nutrient dense fodder perfect for our cattle. As mentioned many times in my articles, the humus content of the soil is incredibly important in biodynamic farming, and the contribution from animals really helps an increase humus level which in turn means healthier soil and better cover crops. And so the circle of life continues.